When we talk about corruption, we think of big government and big business. But corruption pervades every aspect of American culture and society. It’s a rot and decay that threatens to destroy American civilization. We hardly notice anymore. Here’s an example of the current American zeitgeist: Driving from West Ocean City to Salisbury. In the rearview mirror, about a half-mile back on Route 50, is one of those big, modern ambulance vehicles. These emergency vehicles are full of life-saving equipment. The attendants are highly trained EMT’s (emergency medial technicians), guys and gals who can stabilize a heart-attack victim at 60 mph. This ambulance was on an urgent mission, all its lights flashing, its horns blasting and siren keening. I stayed in the right lane and kept an eye on the vehicle as it gradually gained on me. When the ambulance drew within about 100 yards, I steered to the right, across the rumble strip, and came to a stop on the shoulder. The ambulance went screaming past, and I pulled back onto the highway. Following along at a safe distance, I couldn’t help noticing that not a single other SUV or pickup truck or car pulled over. Not one driver bothered or cared to let the ambulance go first. Maybe they were all too busy talking on their cell phones. Maybe they were focused on texting. Whatever the cause, the drivers were absorbed in self-interest, and insensitive to others. As luck would have it, the stoplight at Stephen Decatur High School turned red, and a half-dozen SUVs stopped at the light, blocking both travel lanes. For a moment the ambulance driver considered the left-turn lane as an escape, but that lane too was blocked. Drivers of my father’s generation pulled to the right curb without hesitation at the first sign of an ambulance or firetruck. It was almost a matter of honor to see who could pull over first. Now, no one cares. This is the decline of civilization. My father’s generation fought to save civilization. They knew the value of life, and understood the concept of duty. They knew what to do. They would have been ashamed to block an ambulance. They had a sense of personal responsibility. They instinctively put the needs of the community before their own comfort and convenience. Today, people shrug off responsibility. The government or the company or the union is responsible. Today, people don’t understand the connection between choice, action, and consequence. It doesn’t occur to today’s SUV driver that blocking an ambulance might cause the death of the patient inside. That’s too difficult an exercise in logic, or conscience, or ethics, or something. I’m afraid I’m not explaining this very well. It’s like a concept too abstract to nail down with words. What I’m trying to say is: We’re all playing our supporting roles in the corruption. Any institution can absorb a little corruption. But when corruption spreads like cancer, when corruption rots the walls and the foundation, the institution will collapse. Sometimes in history, the collapse has appeared to be sudden, even though the corruption had been spreading for a long time. It’s not only about government or business. It’s about you and me. When enough individuals fabricate financial reports, evade taxes, cheat on university exams, falsify scientific research, refuse to vote, block ambulances, hide from jury duty, defraud the vulnerable, gamble for recreation and investment, value amusement and entertainment over work, allow children to go hungry and uneducated . . . that civilization is toast. (2013 NOTE: Is the situation getting better or worse? It’s getting worse. 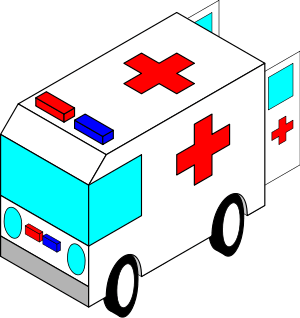 Even a public service as basic and apolitical as emergency medical service is subject to the dysfunction afflicting many American institutions. An angry dispute has been festering for months between the town of Berlin, Maryland, and the local Berlin volunteer fire department. I won’t go into details. This week, newspapers are reporting a troubling incident involving transport of an injured person from a fatal highway accident. This entry was posted in Life, News and tagged Ambulance, America, Berlin MD, Civilization, Corruption, Dysfunction, Emergency medical service, Ethics, Failure, Fire Department, News, Personal responsibility, Volunteer fire department by Editor (Retired). Bookmark the permalink. The ambulance example is very realistic (frighteningly so! ), as I have witnessed this very scenario myself more than once. Despite living in a metro area, I’ve never seen a situation where drivers refused to pull off to the side, but I do believe there is a decline of civility, common sense and ethics in the public arena. I’ve also seen incredible acts of bravery, integrity and compassion, so I don’t necessarily see an inevitable decline in civilization, just recognition that we need to work at being better at leading and being good examples for one another, as well as raising expectations of our political and community leaders. This might explain the political divide in America, too. Another example of a decaying USA.